Town Centre Management and the union of shopping and leisure. Analysis of the consumer process for the union of shopping and leisure. The planned shopping centre: the logic to be followed. Managerial activity related to Town Centre Management. “Cultural” attractions as a basis for creation of an original merchandise mix. The roles of private and local public enterprise in governance of Town Centre Management projects. Town Centre Management is a re-positioning strategy relating to the town’s entire supply of services. Its aim is to be able to come up with a more efficient response to an increasingly more demanding market. It will exploit current conditions to “re-think” large tracts of territory in terms of productive and/or residential activity, and in a different way, so as to create new “products”, which will interpret in an appropriate fashion the variety and variability of demand, and which will be managed with original methodologies and techniques. To attempt to identify a balanced mix of distribution formulae and leisure services aimed at satisfying in a complementary manner, and possibly within the context of the self same shopping (leisure) expedition, the need for commercial and leisure services in one or more demand sectors. Efficiency saving in community services. Satisfy demand to a greater extent by frequentation of certain areas of supply, thereby further stimulating consumption. The planned shopping centre was born following the creation of the single entrepreneurial figure who was responsible for promotion and management. It offers a mix of services (specialised and un-specialised commerce, leisure activities and admin services, catering, etc.) driven by a merchandising plan. They can also be specialised in order to complete the offer of pre-existing commercial areas with natural attractions and/or urban buildings or structures of particular historical or architectural interest. Identification of the portion of urban territory on which to intervene. Creation of the figure of promoter and future manager of the business, drawn up mainly by private operators and with input from the Council of the community where the TCM zone is situated. Socio-economic feasibility study of the initiative undertaken by the promoter. Wide-scale awareness-raising of the relevant economic categories. Setting up of an institutional panel, with consultant and strategic functions, made up of all participating bodies, (trade associations, mayors, local governments, chambers of commerce, university, police and judiciary). Analysis of the potential demand for shopping and leisure. Definition of the “product” (contents and positioning). Identification of the “signs” to be involved (merchandise mix). Definition of the “optimal” layout (merchandising plan). Identification of financial partners in the initiative (banks, property funds, insurance companies, venture capital companies). Research and activation of eventual sources of subsidised funding (European Union, National government, Regions, European Investiment Bank, etc.). Elaboration of the project’s overall financial plan. Identification of property owners and tenants in the area relating to the project. Formulation of the inclusion/exclusion policies in relation to operators present in the project area. Drawing up a plan (quantitative and stylistic) for the structural development of property (public and private) to be used in the project. Active involvement of relevant public offices in extraordinary property maintenance (public and private). Drawing up a plan to develop essential public services (transport, cleaning, security, lighting, road access and parking). Drawing up a plan for the pedestrianisation and equipping of the areas relating to the project (benches, green areas, etc.). 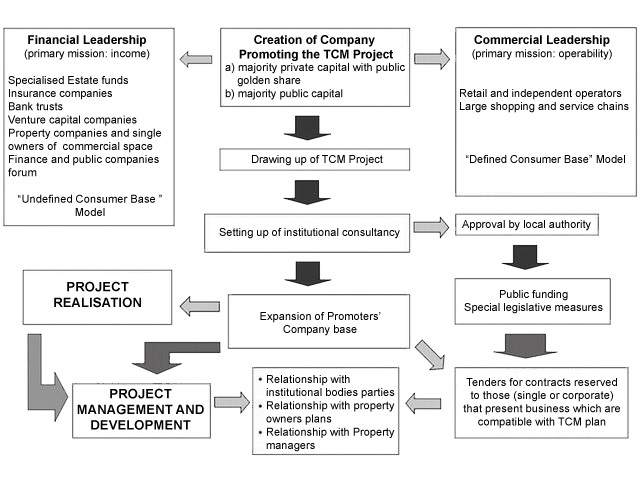 Management of relations between property, commercial management and institutional stakeholders. Income management for the property. Ordinary management of common areas and services. Preparation and management of ordinary maintenance budget. Preparation and management of promotional investiments budget. Monitoring of end-user customer satisfaction. Market analysis to determine the merchandise mix to employ in the area. Exploitation of historical and artistic features of the area which is destined for urban redevelopment. Investiment’s financial sustainability achieved by involving economic operators from commerce and services. Utilisation of local signage to be strongly rooted in the area in question vis-à-vis tradition and image in the specific field of the goods in question.